View of Eiffel Tower fro the temporary “Pop up bar” on the 10th floor of the Pullman Eiffel hotel. A week last Wednesday, I lost my temper at work. This is very unusual for me and very unprofessional. I didn’t think I can ever remember loosing my temper at work before. I had a full blown Diva, tantrum, shouting, stamping feet, storming off, slamming doors, followed swiftly by tears, (also unknown), and an apology to my shocked colleague. The truth is that, I just wanted to be in Paris alone…….. Away from the pressure of recent redundancy consultations, the frustrations of ” efficiencies” ! ….and worry about people I love. It is bitterly cold in Paris, with snow flurries, which sends my friend “Muriel” into raptures, because she is not used to snow where she comes from in Australia. Cynically I tell her that she does not know what snow is until she has had to shovel it off the road to get out of the drive. Then she may not be so rapturous! Ironically I am not alone in Paris. Unknown to me, Muriel decided to relocate there at the end of January, “Kittymum” decided to pop across from Denmark for a haircut ( as you do!) and “Dognapper” from the US, thought she would take a once in a lifetime opportunity to see the new bells of Notre Dame before they were installed. I had lunch with “Out and about in Paris” . Who is such a lovely person and through her I have expanded my blogging world and got in touch with so many interesting people. We eat in her “hood” at Chaumette, a cosy French restaurant at 7 Rue Gros in the 16th. Traditional white tablecloths and sparking glasses, quiet hum of conversation, plus excellent service. The 23 euro formula lunch is delicious with a starter of Pate, some sort of fish for mains and a dessert of caramelised pineapples. I never have the language or memory to describe food, like foodies do, but I think this modest place would please them. After lunch Out and about in Paris, takes me to Orphan Apprentices d’Auteil on nearbye Rue Fontaine, local Catholic church and complex, with a Bistro, park, gift shop and charity shop. This organisation has trained thousands of disadvantages children for jobs, since around 1871. We browse the charity shop and I buy a small jar to keep ginger in my kitchen, which will now remind me of Out and about in Paris and our lovely afternoon together. Charity shops, where people bring unwanted clothes and bric-a-brac, to be sold for the charity, seem to be little known in Paris. So it was interesting to see this one. In England, every high street is full of four or five and they are big business. These days they are often run using large organisation methods of targets and marketing, which has put off several volunteers I know who work there. Bol Vougirard is not the prettiest part of Paris , it was freezing cold, damp and snowy and in disappointment and a low moment I thought to my self ” What on earth are you dong, wandering around Paris alone in the cold and damp, when you have wonderful people at home? I didn’t have time to go across town to go anywhere else, as I wanted to go to an AA meeting at 1630h on Rue Madame, so I decided to go up the Montparnasse tower, it looked warm and inviting ( yes I know it is ugly, but in my mood, she looked kinda nice!) and there was coffee up there, also the price had been reduced to 6.50 euro as the visibility was reduced. 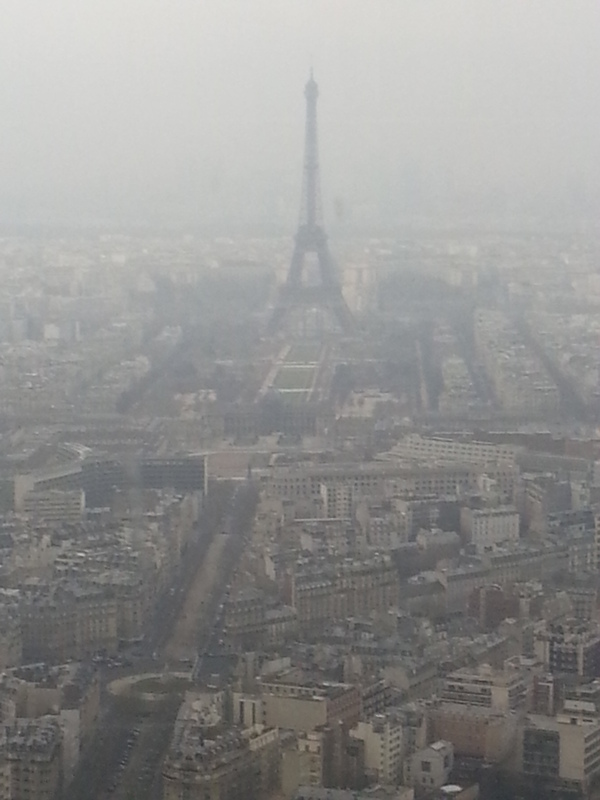 So, cosy and warm, on the 56th floor of Montparnasse tower, with Paris laid out in front of me, looking very mysterious in the snowy mist, despite the limited visibility I can make out the landmarks and I can still marvel at the beauty of this city that I have an ongoing love affair with. My mood lifted and I realised why I love this city,. 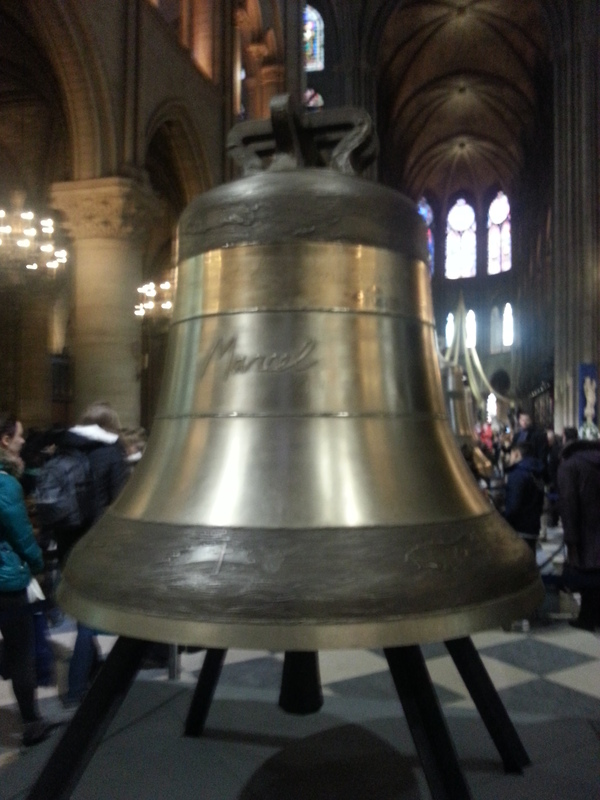 Tags: Bells of Notre Dame., Chaumette Paris restaurant, Tour Montparnasse. Hotel Pulman Eiffel. Bookmark the permalink. Previous post ← OOP’S! I SEEM TO HAVE ACCIDENTALLY DELETED THE LAST POST. Hi bossy, Yes it certainly felt that Paris was in empathy that day. Although I have a lot to be grateful for. Hope you are well in NZ. Summer is coming to an end there. Glad you have enjoyed the summer. Not TOO hot for you. Enjoy your retirement. More time to come to Europe!…..get away from the miserable weather. This morning in England, the sun is shining on the Pennine moors, with the promise of a beautiful spring day. Still chilly but we have turned the corner and survived the winter. Think I will go for a walk. Hi Dora, thanks for posting. Sorry I missed you in Paris, I think you got a bit of good weather. I always have a winter trip (s) and theses January and February trips have had the coldest and worst weather ever. Whenever we hear the bells in the future we will remember we saw them. oh yes I had forgotten about our mutual friend’s title ‘dognapper’!!! LOL!! I remember from the Vendange last year she just up and dognapped that cute little doggie!! I wonder if she needs another alarm clock??? LOL! sorry Sandy, couldn’t help myself, Denise brought back some wonderful memories for me!! After that incident , I always get a little nervous when Dognapper approaches a doggie on the street, (as she is prone to do)…..I don’t really want to add ” aiding and abetting dognapping” to the list of other misdemeanour’s, my associates have been involved in lately! That would truly get me struck off! you know how the British feel about that sort of thing! So funny you two – “Dognapper” – “aiding and abetting” Indeed!!! Actually, I would like to take one of those little critters with me – can’t help myself as they are just so cute!!! Just wouldn’t want to get caught as we’d all end up in the klinker together!! And no, I don’t think I need another clock – I should take a picture of my shelf with my now two clocks sitting there side by side ticking away the time in Paris!! LOL!! Ditto what Roniece said about this post – straight from your heart for sure! 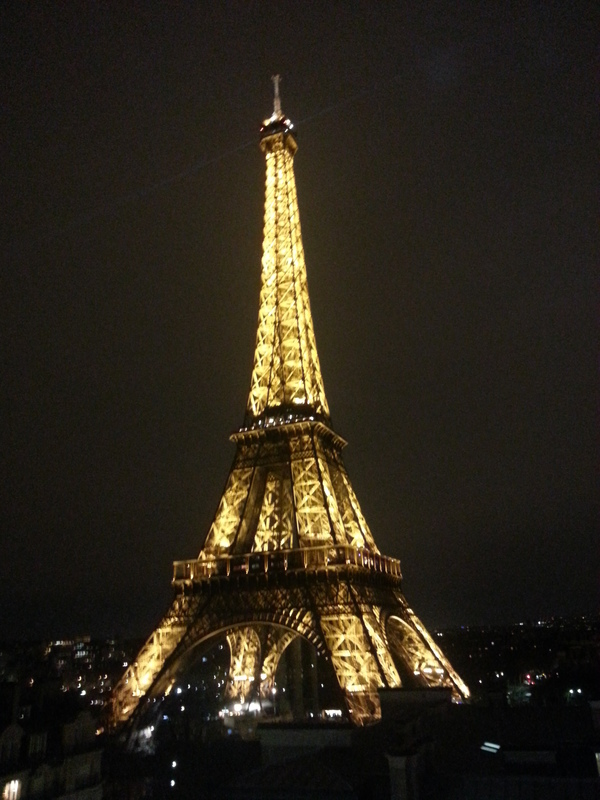 Very nice – and I love the “sultry” pic of the Eiffel!